Particle & Surface Sciences are the sole distributors throughout Australia and New Zealand for the fully automated Micromeritics ASAP 2020 accelerated surface area and porosimetry system. Physisorption instruments measure surface area and pore size. Chemisorption instruments measure metal dispersion and metal surface area. The one-port analysis manifold/vacuum system and two-port degas manifold/vacuum system are independent and operate concurrently. 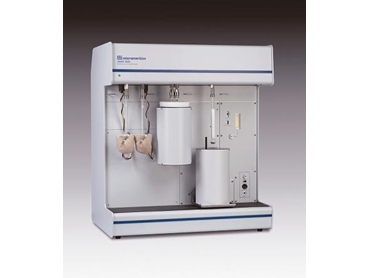 Micromeritics’ ASAP 2020 accelerated surface area and porosimetry analyser uses the gas sorption technique to generate high-quality data for research and quality control applications. Available options include the micropore option, the high-vac option and the chemisorption option, which uses the static volumetric technique to determine the percentage metal dispersion, active metal surface area, size of active particles as well as surface acidity of catalyst materials. Data obtained by the ASAP 2020 accelerated surface area and porosimetry analysers are used to achieve efficiency, safety, quality, and profitability in any modern materials-oriented work, and can be used by scientists with confidence and assurance. The ASAP 2020 accelerated surface area analysers are used to characterise the active and support surfaces of catalysts, determine the high surface areas of adsorbents as well as determine the microporosity and hydrogen storage capacity of various nano materials. Materials with low surface areas such as powdered metals, glass fibres and natural organic materials can also be analysed. The pharmaceutical industry uses the ASAP 2020 to analyse tableted products, the surface area being directly related to dissolution rate. Trained staff from the company can help users determine how the ASAP 2020 can be used for their applications.